In addition to the Fed’s pivot to more dovish policies, the Fed will also re-examine its framework for setting its inflation rate target. One possible framework would use average inflation rate targeting. If adopted, the Fed would let inflation run higher when necessary to offset periods when inflation ran substantially below its two percent target. Using average inflation targeting (AIT) would permit the Fed to give inflation more headroom before tightening monetary policy. The obvious first question to ask, even before introducing (AIT) – when will inflation reach the Fed’s current 2% personal consumption expenditure (PCE) inflation target? The Fed keeps expressing confidence it will. So far, their target proves elusive. The second broad question, who would know what that uncertain target might be. 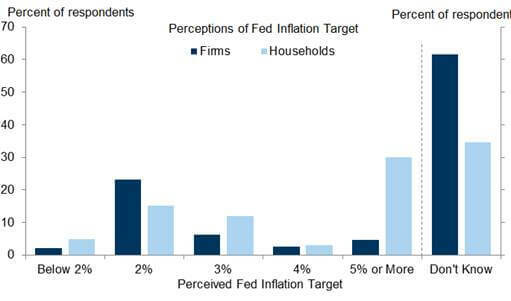 As evidence, despite the Fed’s well-publicized 2% inflation target, many still exhibit little knowledge of that target (see Figure 1). In reality, most consumers likely sense inflation simply based on their frequent purchases – food and gasoline. Economists use the Philips Curve to base their inflation expectations. That curve showed a trade-off existed between unemployment and price inflation. 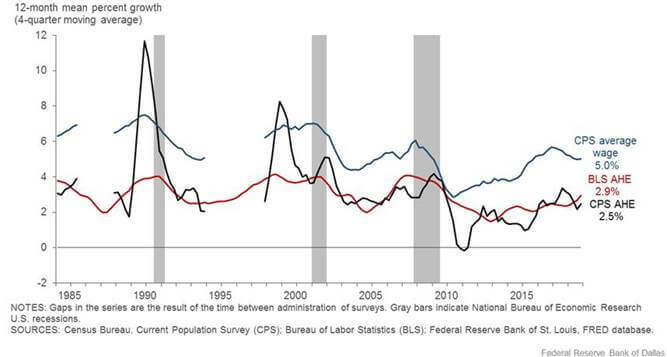 Simply, or now not so simply, when the unemployment rate fell below a specific point inflation would likely increase. Yet, despite our current historically low unemployment rates, inflation remains relatively dormant. The study points out that the Bureau of Labor Statistics (BLS) average hourly earnings calculation understates average wage growth. The Dallas Fed argues that the BLS gives greater weight to wage growth of workers later in their careers. Their relatively higher wages create that overweight. 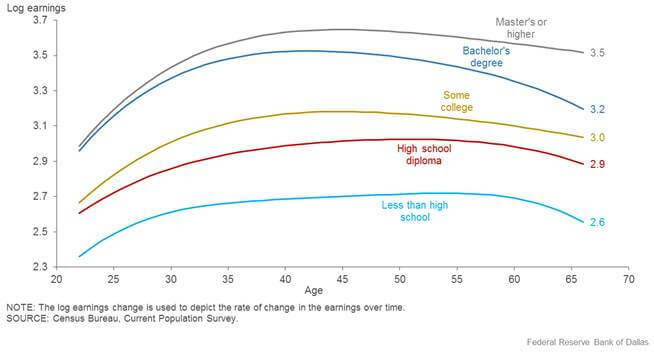 As a result, the BLS gives less weight to faster growing but lower wages of those early in their careers (see Figure 2). The Dallas Fed’s study concludes that giving greater weight to higher but slower growing wages understates average hourly earnings (AHE) growth. Instead, using the Current Population Survey (CPS), the Dallas Fed calculated average individual wage growth. Their result consistently exceeded the BLS’s average hourly earnings growth rate. Specifically, Figure 3 shows the CPS’s average individual wage growth reached 5.0% or about 2% higher than the BLS’s average hourly earnings Figures. The mystery continues, if their results correctly reflect more rapid wage increases, then why does inflation (PCE) remain subdued? Will wage increases finally cross over to price inflation? Let us turn the mystery around. Perhaps the mystery may be in the economic models used by the Fed and academic economists. Nearly a decade after the global financial crisis, the combination of modest economic trend-line growth and lower than desired inflation continues despite using unconventional monetary and expansionary fiscal policies. Perhaps this suggests that our economic models need some fresh thinking. Likely, those models reflect a past economic mix that possibly no longer reflects the current complexity of economic forces. The increased influence played by financial markets and intermediaries over the real economy needs greater examination of their roles. No matter how it is measured, wage growth seems to be increasing at a rate faster than prices. If correct, businesses with a heavy labor content could see their profit margins under pressure. One reaction, competition permitting, will be to raise prices. A second possible alternative will be to use capital as a substitute for labor. By improving their productivity, businesses could stabilize or improve their margins. Stocks of companies with relatively low labor costs should gain a premium in valuation over those with higher employee cost burdens. Investors should determine whether those companies, with higher labor burdens, can command sufficient pricing power to offset rising employee costs. Future revenue growth will be a key measure to the investment attractiveness of those companies if margins suffer. For those interested, the addendum, Figures 4 and 5, serves as a reminder of the inflationary period of the 1970s and early 1980s.